Alice passed away peacefully on November 24 at the age of 93. Alice was born June 7, 1921 in Wetaskiwin, AB and moved to Edmonton with her family about a year later. Alice was predeceased by her partner, Bryan Campbell Hope 2009, her father, Percy Thomas 1935, mother, Ruth (Sandin) 1979 and bothers Raymond, 1929 and Lloyd 1954. Alice leaves behind cousins from the Sandin family, good friends and former colleagues who respected her dedication as a nursing educator at the University of Alberta, Faculty of Nursing and at the Foothills Hospital School of Nursing in Calgary. Alice grew up in the Garneau area of Edmonton. Her father owned a jewelry store on Jasper Avenue. 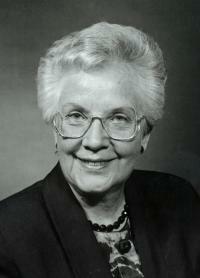 Alice graduated with a Bachelor of Science in Nursing from the University of Alberta in 1946 along with 9 classmates. She went on to become a Faculty of Nursing Assistant Professor where she was involved in both teaching and curriculum development. Throughout her career, Alice was highly respected as a very strong leader who provided great support for her students. Many showed their appreciation by keeping in touch with her over the years. After retiring, Alice continued her association with the University of Alberta by organizing Reunion Weekends, participating in the Alumni Relations and the Nursing Visiting Committees for both Nursing and the Faculty of Arts. Her interests in advancing nursing and health care continued as a volunteer for the University Hospital Foundation and later served on the Board of Trustees. She also was very involved with the Order of St. John where she was recognized by being named a Dame of the Order. Alice’s legacy also lives on through two books that she wrote on the history of hospitals in Alberta and also through her philanthropic support of the University of Alberta, the University Hospital Foundation and many other worthy charitable organizations. Her support for students at the University of Alberta continues through endowed funds: the Lloyd Thomas Award in Music, the Alice Thomas Bursary in nursing, the Mackinnon bursary for International Students, and the Ambassador Award for undergraduate students in the nursing profession. Alice loved to travel and even in latter years she and Bryan visited Sri Lanka, Thailand and China. Together they shared a great love of nature, culture and history. Although Alice requested no funeral service, a tribute recognizing her substantial giving to the University of Alberta, Faculty of Nursing and the University Hospital Foundation will be announced in the New Year. A special thanks is given to the staff at Capital Care Dickensfield for the care provided during Alice’s last days. Donations in memory of Alice may be made to Capital Care Dickinsfield, 6th Floor, 100909 Jasper Ave. Edmonton, AB T5J 3M9.